The Celts were the ancient inhabitants of much of Europe. A spiritual people, their rich mythology and symbology later merged with the Christian beliefs they embraced to create a distinctive art seen especially in Ireland and Scotland. 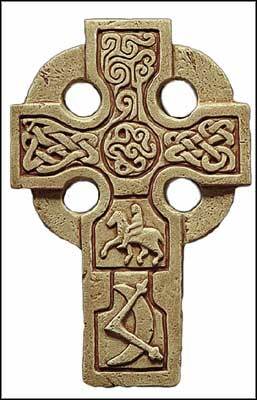 The Celtic Cross is known throughout the world as the emblem of Celtic Christianity and it can be considered the symbol of Celticness itself. Celtic Crosses began to appear during the fifth century A.D., it's shape is derived from a pagan sun symbol, the sunwheel, which later became a symbol of the Christian Godhead. The sunwheel was originally a cross surrounded by a circle with a center stone representing the sun and mock suns at the four quarters. The stone at the center of the circle also represents the navel of the world. The stone pillar of the cross also embodies phallic and fertility characteristics. The cross represents eternal life; it's horizontal axis being the earthly world and the vertical axis the heavenly world coming together as the union of Heaven and Earth. Celtic Crosses are imbued with continuous and interwoven knot and spiral motifs symbolizing the continuity of life, death and rebirth. The Picts (meaning the painted ones) were a powerful tribal federation north of the river Clyde, Scotland. Known for their sophisticated stone carvings, their style of crosses was characterized by having animal images.